While listening to the Ed Schultz show on radio, I heard an exchange with a listener who identified himself as a conservative. He offered that participants in the Occupy Wall Street movement should, as he did, take steps to improve their own lives and not blame others for their problems. That kind of talk infuriates me, because it’s an easy way for Republicans to avoid taking a hard look at issues that broadly affect millions upon millions of Americans. 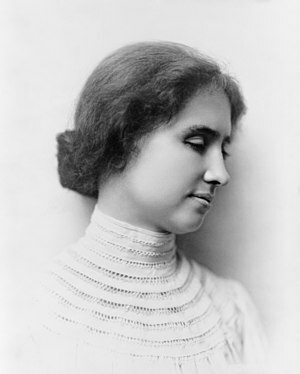 Helen Keller became an avowed socialist and fawning apologist for the nascent Soviet Union…an unpopular position to be sure…but it does not diminish the implicit humanity and compassion in her words. She understood the influence of circumstance and, more importantly, she felt no joy at the misfortune of others. I confess to being ideologically driven; I find little that I am willing to compromise with those whose selfishness and greed overwhelms any sense of compassion and caring. But, more importantly, I am deeply saddened that my country’s fundamental immorality is on display for the rest of the world to see. America and Americans should be better than this. I’m a media junkie, and I have enough miles on me to remember that Sunday meant, in addition to church, a pile of newspapers. We’d pick them up at the newsstand after swinging by the bakery for crumb buns. I read all the funnies…the Journal American’s were best, I recall…and my father read the rest. For him, reading the news wasn’t entertainment. It was his mission to stay informed. I made it my mission, as well, but doing so isn’t easy in the sound-bite, spin-laden and context-deficient world we live in. It takes work and it’s work that most people don’t care to do. If the sound-bite world of broadcast media has done any good at all, it can be argued that it has defined the problem: most people don’t give a damn about points of view other than their own. Rather, they want black or white ideas…never shades of gray. Let the liberal, intellectual elite wallow around in that “shades-of-gray” muck if it wants to. Just give me some of that old-time, right-wing political certainty…and a beer. I spent many years in the media business…on the magazine side…but my passion was all media. When cable TV spread across the country and the promise of hundreds of channels captivated our media-junkie imaginations, I saw the risk of an increasingly balkanized world of ideas, where like-minded consumers of information all drank from the same cup. Then, the internet pushed the idea even further. I recall a segment of public radio’s “On the Media,” which aired some years ago. One guest was from the newspaper business and the other represented the, then, some-what new world of Internet-delivered news. It was like the Christians and the Lions. The internet guy hit all the hot spots: people don’t have enough time to read newspapers; most of what’s in a newspaper isn’t of interest to the reader; the internet is immediate and evergreen; and, best yet, internet news can be customized. Only “your” news that’s fit to print, delivered daily, and it doesn’t even kill a tree! Well, to me the value of a good newspaper is the same as the pleasure of dining at a good buffet. While you may walk up to the buffet table looking for one kind of food, chances are you will return to your table with some enriching surprises. Sadly, this view hardly matters any more. So, what to do, what to do? I don’t know to do anything but continue pushing the multi-source information envelope and hope that someone, somewhere uncovers a way to package it in a manner such that people won’t feel as though their cherished ideas are being attacked. Am I hopeful that this will come to pass? Of course. Do I think it will? No. Unfortunately, freedom of speech is, for most people, the freedom not to hear…or care.